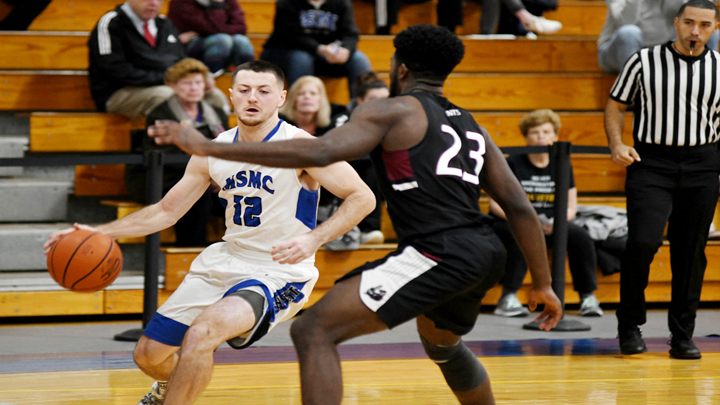 MSMC Senior Connor Bacci posted a career-high 21 points. NEWBURGH – Senior Connor Bacci posted a career-high 21 points and the Mount Saint Mary College Men’s Basketball team remained unbeaten at the Kaplan Center on Saturday following a convincing 88-68 victory over visiting St. Joseph’s-Brooklyn. The win moves the Mount’s home record to a perfect 9-0. After the two teams traded the lead eight times over the opening 4:37 of the contest, the Mount grabbed the lead for good on an Ethan Fox jumper at the 14:15 mark of the first half. The bucket was part of a 16-2 run that saw the Mount sprint out to a 26-14 advantage. The Mount went 7-for-8 from the floor over the run that covered better than four minutes, with Bacci leading the way with four points. St. Joseph’s climbed back to within five points on a Zach McDonnell jumper with just over seven minutes left before halftime, but three-pointers from Kendall Francis and Bacci helped push the Mount’s lead back to 37-26 with 4:52 left before halftime. Mount Saint Mary grabbed its largest lead of the half following a pair of Jovin Ramo free-throws with 1:22 left in the half that moved it in front 47-31, but two Frank Reali three-pointers in the final minute, including one at the horn, brought the Bears to within 47-37 at the break. The Knights, who eclipsed their point total from Thursday against Purchase in the first half, shot an efficient 58.1-percent from the floor and went 7-for-15 from three-point range. Francis and Ramos led the Mount at the break with 11 points apiece. After allowing the Bears to within eight points on their first possession of the second half, the Mount used a quick 9-3 spurt, capped by a Bacci lay-in with 15:39 left in regulation, to pull back in front 56-42. After moving back in front by 10 to start the run, the Knights never let the Bears closer in the game. The advantage reached a game-high 20 points on three occasions in the final 4:24, including on a Francis jumper with 2:27 left that closed out the scoring in the game. The Knights remained efficient after halftime, converting at 51.7-percent after the break, while limiting St. Joseph’s to 35.5-percent in the second half. The Mount made four more field goals on two fewer attempts than the visitors in the second half. Bacci scored 14 of his career-high 21 points after halftime and finished the game shooting 8-for-14 overall. He added six rebounds and a game-high six assists to the winning effort. Francis posted 20 points for the Mount, knocking down three triples, to go along with three assists, four rebounds and a pair of steals. Ramos rounded out a trio of Knights in double-figures with his 11 first half points, going 3-for-3 from three-point range and adding four rebounds. Fox led the Mount with 10 boards and joined Paul Sienke with nine points in the contest. Jameson Morton continued his strong play off the bench with eight points, four rebounds and a pair of helpers. St. Joseph’s was led by a game-high 22 points from Reali who knocked down five three-pointers and controlled seven rebounds. Kavan Meiner chipped in 19 points and a team-high nine rebounds, while Dimitri Sirakis handed out six assists and chipped in seven points. Mount Saint Mary shot 55-percent from the floor in the game, its second highest percentage of the season, and rounded out the win 9-for-23 from three-point range. The Knights held the Bears to 41-percent shooting and outscored them 44-28 in the paint. Saturday’s win moves Mount Saint May to 12-7 overall on the season and to 9-5 in Skyline Conference play.